Wristband Resources makes it easy to create the perfect wristbands for your needs with the confidence they'll look exactly like you expect. Durable, paper-like wristbands with an adhesive closure. Create perfect bands with our online designer! Custom imprinting of logos, text, or images is available for Tyvek®, Plastic, and Vinyl wristbands. Imprinting the wristband is an affordable way to make your wristbands unique. The added features of promotion and security makes custom imprinting a real value. Your logos or special text can be added to any of our wristband styles. Our in house graphic artists will furnish a proof to you within 24 hours of receiving your approved art work. It’s easy, affordable, and fast. Your wristbands will stand out at and after your event. For added security and tracking purposes, bar coding is the perfect answer. Our bar coded products are checked prior to production to ensure readability. Bar coding can be applied to all of our materials and wristbands. Bar coding is a solution for tracking attendance levels for one event or visits to many attractions. The added security means no opportunity for counterfeit wristbands. We accept a variety of codes. Contact our helpful service representatives for assistance! Custom number options are only limited by your imagination. Track the number of bands used, track your inventory, account for admission fees, use numbers to distribute prizes (drawings), and more. Custom numbering and unique codes can be applied to all the wristbands we produce. Just ask our sales team for their expert guidance. Match identical numbers for security purposes. Excellent solution for day care or school outings. Match the guardian with the child, exactly. Use duplicate numbers for tracking equipment and inventory purposes. 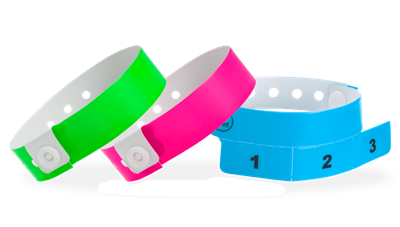 Attach one wristband on the product or device. File the other duplicate number wristband. You can even write notes on the wristbands for informational purposes. Duplicate number wristbands are available in Tyvek®. Verify admission counts with tear off stubs. This simple but effective device allows for exact matches for tracking purposes or as raffle verification. Use the stubs as the entry ticket for your event. Affordable. with less hassle and mess. Tear off stubs are available in Tyvek®, Plastic, and Vinyl. All Tear off Stub wristband can be customized with your logo, text, or image. Tyvek® wristbands are perfect for short term use at events because they are affordable, durable and secure. Our Tyvek® wristbands have a strong adhesive closure to make them tamper proof and secure. Each band is sequentially numbered and is made from 100% recyclable material. They are the perfect product for admit one entry. Woven and imprinted cloth wristbands are unique and secure. They offer an extremely comfortable fit that is both durable and water-proof. Cloth wristbands can be customized with great details. Wondering where to buy wristbands? Click the "View Ready-Made Cloth" link below. Lanyards are great for admitting attendees into your event or they can be used as key chain lanyards. We allow you to customize your lanyards and we offer badge holders that are perfect for attaching a badges to a lanyard. For a totally unique and dazzling appearance, try Holographic. Colors and hues change as the band catches light from different angles. This comfortable plastic wristband can accept print. All made in the U.S.A. and completely recyclable plastic. Great for bars, VIP events, weddings, concert, and other special events. Custom imprinting is available on these wristbands. Get great color and design with in a full color product. Multi-color wristbands showcase your logo or message, which makes it unique and secure. 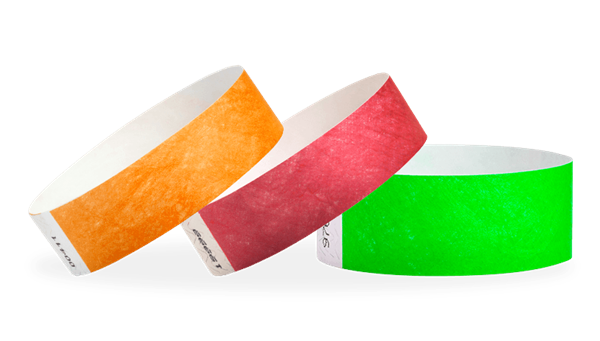 Multi-color wristbands can be produced on Vinyl, Plastic, Silicone, or Tyvek®. Our in-house production in New Berlin, Wisconsin, so turn around time is faster and quality is controlled. Try your logo in multi-color and see the difference. Plastic wristbands are very comfortable, light weight, provide extra security and wear time. The durable plastic is stretch resistant and waterproof. The quality plastic reproduces great color for full color imprints. As low as $0.39 per wristband! Our Silicone wristbands are produced with exacting standards for quality and purity. All wristbands come in individual bags and are SDS certified. Select from Debossed, Embossed, or Imprinted custom options. Vinyl wristbands are an excellent choice for extended wear and custom imprinting. Made from a soft, comfortable vinyl, the wristband is durable with a three layer construction. The closure is totally secure with locking plastic snaps. Custom Production in as low as 5 business days. Individual, tear off tabs, allow for exact control of multiple activities. Each tab can be used for a ride at an amusement park, use tabs to track drinks or food, use tabs for specific offers. Cash tags are made with soft comfortable, and completely recyclable, vinyl. The security options make this an affordable and unique product. You can also customize the wristband and each individual tab for a high quality wristband. Check out our wristband reviews! We are proud to offer the best wristband turnaround times in the industry. If you're looking for wristbands in a variety of materials and colors, Wristband Resources has you covered! We are proud to offer the best wristband turnaround times in the industry. No matter your needs, we have in-stock wristbands that can ship to you same day, or custom wristbands that can ship as early as the next business day. When you order wristbands from us, we guarantee they will arrive quickly. We lead the industry with our speed, quality and price. 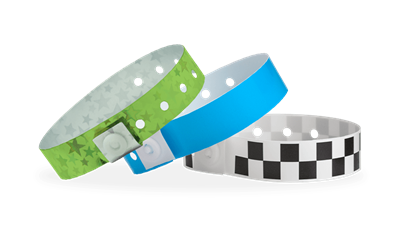 We also offer the widest wristband product selection anywhere, including colored wristbands and a variety of other patterns and options. We carry Tyvek (paper), plastic, cloth and vinyl for crowd security and identification purposes. If you are planning an event, you may be interested in our silicone wristbands. These are most commonly used for promotions or cause-related events and fundraisers. Unlike wristbands from other suppliers, our quality silicone bracelets are guaranteed to be durable and long-lasting. All of our wristbands for sale offer in-stock and custom options, giving you the flexibility required for your next event. We also offer lanyards and lanyard badges. Lanyards can be used for security or identification purposes, or as keychain lanyards. Reinforce your brand by customizing your lanyards including sumblimation (full color) or woven. Why Order Wristbands From Wristband Resources? When you buy wristbands from us, you can relax knowing that customer service is our top priority. With more than 20 years of experience in the industry, we excel at bringing our customers the best service along with low prices, fast turnaround times, quick shipping, and bulk wristband discounts available on a per-product basis. Whether you're looking to buy wristbands for a certain event or custom-design colored wristbands for a fundraiser, we are sure to have what you need! We are constantly improving our products and printing methods in order to stay ahead of the game. Our quality support staff is knowledgeable about the wristband industry and happy to address any concerns you may have about our products. If you can't find what you are looking for or have questions, please contact us for a quick response.